Is Cognac better than Brandy? A hotly debated topic in local circles, fueled by the aspirant high priced image of Cognac, against the misrepresented cheaper and less premium image of Brandy. I’ve always wanted to try and answer it with some certainty, and what better a way to try than a blind tasting of some fine Cognac’s against premium Cape Brandy. 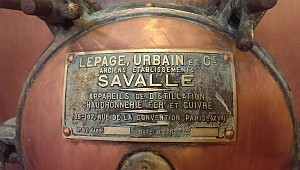 French copper potstills making fine Cape Brandy! But first a step back. There is only one “style” of Cognac in the world, but a few styles of Brandy. In order to compare apples with apples, we must taste the Cognac (100% distilled in copper potstills), against Potstill or Cape Brandy, also 100% distilled in copper potstills. That way we’re on the same page. As the experiment progressed, and the individual products were revealed to us, it became evident that as much as there are similarities between the two, there are also some tell-tale differences. A lot of it starts with the nose. The Cape Brandy is a little more fruity, with less obvious sweet notes like chocolate and caramel. There’s also something unique on the Cognac nose, that we couldn’t quite define, a spicy almost medicinal undertone that is notably absent in the Brandy. On the palate, the fruit driven nature of the Brandy really shone through, a testament to our stronger sunshine and full-fruit grapes. Spices – Clove, Cinnamon and Nutmeg are much more prevalent in the Cognacs. Some people did notice a slightly stronger finish to the Cognac too, perhaps due to the 2% stronger ABV% (Potstill Brandy is generally 38%, Cognac 40%), but also perhaps just attributed to the different making styles. So is Cognac really better? In this room, with this specific group assembled, I’d have to say: No. 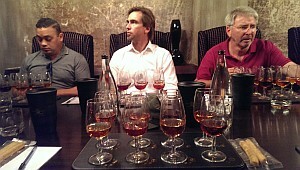 As good as the Cognacs in the mix were, the Brandy definitely seemed to come out on top for most people. What was perhaps most evident from the experiment though, was the natural bias that we seem to carry with us on our palates. As South Africans, we are treated to wines that are big and bold, and full of fruit. It’s what we’ve consumed the most of in our lives, it’s what we’re used to, and ultimately what we enjoy. Similarly too with Brandy it appears. It would have been interesting if we’d had a few Cognac aficionados in the room, to see if the same bias was there in reverse. I’m almost certain it would have been. Officially though, the two will never be judged against each other internationally. A real pity, given the true quality of them both, and the similarities in their production. But I’ll go out on a limb and say that as much as I’m enjoying getting to know Cognac, for a South African palate, our brandies have it spot on. And at a drastically lower price point, let’s enjoy it while the secret lasts. It surely can’t be for long.